Znojmo is a small town (35,000 inhabitants) in South Moravia, Czech Republic. It's famous for its compact old town center, with the oldest buildings dating back to the 11th century, as well as the surrounding Znojmo Wine Region and neighboring Podyjí National Park. 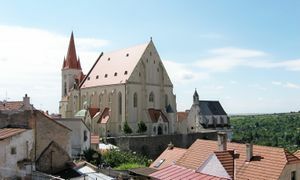 The historic center of Znojmo was declared an Urban Conservation Area in 1971. Though Znojmo stands on a rock overlooking the River Dyje Canyon, the Znojmo region has always been predominantly agricultural (crops, wine, fruit, vegetables) with only light industry (ceramics, shoes, textile). It has a dry and warm climate, lies in a rather flat area 290 meters above sea level, and has about 100 days each year with an average temperature over 15°C. Znojmo, one of the most important cities in medieval Moravia, was first mentioned in records dated 1046. It was around this time that Prince Břetislav I had a castle built there to serve as a local seat of administration for the Přemyslid dynasty. 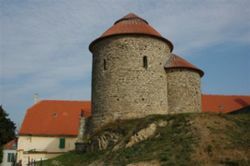 Znojmo Castle was one of many castles which together served as a defense system along the Austrian border. Czech King Přemysl Otakar I founded the Fortified Royal City of Znojmo between 1224 and 1226 according to Nürnberg laws. Then in 1326 King John of Luxembourg granted Znojmo the privilege of trading wine and forbade the tapping of foreign wines in the town. Znojmo became part of the Habsburg Empire in 1526 which diminished its importance. Nevertheless, the city was still able to thrive due to its location on several important roads, including the imperial road between Vienna and Prague. After some time, in the late 19th century, problems between the Czech and German populations in Znojmo began to arise. These problems continued until the Third Reich annexed Znojmo in September 1938. This annexation occurred despite the fact that the majority of residents were Czech. The argument for the Munich Pact decision was based on the census of 1910. In 1938 many Czech citizens had to leave the city. Then, after World War II, the Germans were expelled from Znojmo once it became part of Czechoslovakia in May 1945. From 1948 to 1989 Znojmo suffered under totalitarian communist rule. The center of Znojmo is roughly a circle which can be crossed in 15-20 minutes on foot. It lies just north of the train, coach, and bus stations. You will find the suburbs, quite easily accessible by bus or on foot, to the north and south of the center. The nearest airports are in Brno (70 km away, but only serviced by CSA, Smart Wings, and Ryanair), Vienna (90 km), Bratislava (150 km), and Prague (200 km). There are regular buses from Prague (bus station Florenc 3-6 times a day, 200kč) and Brno (more frequently, 60kč). There are trains to and from Vienna every 2 hours, with a return ticket costing around 500kč. The journey takes 90 mins. Other trains to Znojmo are painfully slow and unsuitable for long distance travel. On the other hand, they are reasonably priced (especially if you know what ticket to buy) and an interesting experience if you are into trains and train travel. They are also more convenient for families and cyclists. You'll probably have to change trains a few times though. From Prague use route E59 the entire way to Znojmo. Route E59 follows the highway D1 from Prague to Jihlava. Exit at Jihlava onto route 38 (still E59). Route 38/E59 will take you to Znojmo. From Brno use the motorway R52 towards Mikulov, exit at Pohorelice onto route 53. From Vienna use route E59 the entire way to Znojmo. Route E59 follows A22 to Stockerau. 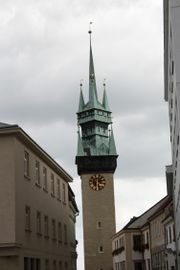 In Stockerau continue on S3/E59 to Hollabrunn where you will follow B303/E59 to the Czech border. Once you reach the Czech border the same road will be called 38/E59. This will take you the rest of the way to Znojmo. There are 7 city bus lines (bus numbers 801 through 805, 808, and 809; 12kč per ticket) plus a seasonal sightseeing train/bus (80kč per ticket). The buses are quite frequent and timely during rush hours, but can be a pain on weekends and after 19:00. Tickets are only available from the driver, so prepare the change (or your nerves) beforehand. Or you can take a taxi. The fare within the town should not exceed 100kč. As in other parts of the Czech Republic, it is advisable to discuss the price in advance. Local buses to villages are similar to city buses as far as frequency and availability of tickets. The bus station is next to the railway station in the center of town on Milady Horákové street. The Rotunda of St. Catherine (Rotunda sv. Kateřiny) Built around the year 1037 by the Bohemian Prince Břetislav I as a large parochial church. 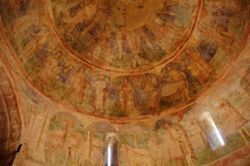 Apparently in 1134 it was decorated with frescoes representing, besides biblical motives, the legend of the calling of Přemysl the Ploughman to the princely throne, and a picture gallery of the oldest Bohemian princes of the Přemyslide family. Open: April on weekends 09:00-17:00, May-September Tue-Sun 09:00-17:00, according to the climate! Admission 90kč. Town Hall Tower The tower nearly 80 m high was built in the years 1447-1448 by the local builder Mikuláš of Sedlešovice. The gallery offers a view of the town and the surrounding area, even including the Austrian Alps. Admission 20/10kč. Znojmo Underground An intricate labyrinth of tunnels below the town centre. Throughout the history of Znojmo they served as storage space, a hiding place from the enemy, and a garbage dump. Now you can take part in a 60-minute, one-km guided tour through this maze. Be sure to join a bigger group of foreigners or pick up a leaflet with information in your language from the reception, because tours are mostly conducted in Czech and foreigners have to form a group of at least 10 people to be able to have an English or German guided tour. Temperature 13°C. Slepičí trh 2, Open: Jul-Aug every day 09:00-17:00, spring/fall Mon-Sat 09:00-16:00. Admission 50/30kč. Outdoor Swimming Pool Louka - Built in 2005. You will find three pools, three waterslides, a wading pool, 26°C water, lockers, play areas, playgrounds, a restaurant, and a nice setting. Melkusova 42, buses 802, 804, 805, 809, or the sightseeing train. Open during the summer every day 10:00-20:00. Admission 60/50kč all day, 50/30kč after 14:00, 30/20kč after 17:00. Znojemské kluziště - A small outdoor public ice rink next to the skatepark and the stadium on Sokolská street. Open 13:00-22:00 provided the temperature is below +10 degrees Celsius. If you like hiking, biking, or wine, be sure to visit Podyjí National Park. The park surrounds the most picturesque part of the Dyje river valley (Thaya in German) stretching from Vranov nad Dyjí to Znojmo. There are plenty of well-marked hiking and biking trails as well as some excellent view points above the river. For wine lovers, the highlight of this national park is Šobes Vineyard. Šobes Vineyard is the most famous vineyard in the Czech Republic due to its attractive location, age, and exceptional microclimate. You can taste wine on-site at Šobes during the summer months. For two days a year Znojmo transforms into a combination of a medieval town (downtown) and a kitschy, loud, and crowded funfair (uptown), all of which is called Vinobraní (Wine-harvest festival). Fortunately, these two are divided by the town walls and gates, so you can choose what you fancy. In the center you can enjoy the parade of people in traditional costumes, the king and queen and their retinue, traditional markets, shows and music, and especially local wine and its young, half-fermented companion - burčák. Fridays are more popular with the younger crowd because you can enjoy the blazing torches, fireworks and concerts at night (check the programme for the times) and indulge in burčák tasting till morning; Saturdays are usually quieter and less crowded. For burčák tasting bring your own glass (it's always better than the plastic ones you can get at every stall) and get 1 dcl (0.1 l) for about 10kč at each stall you like. For wine tasting, check the programme for Znovín Znojmo or Vinné sklepy Lechovice (wineries) and take part in their tasting training, where you sample a dozen of different wines and then try to guess two more blind samples. It's good fun. Vinobraní takes place in the middle of September (f.e. 15-17th Sept 2016) and costs 230/250/350kč (Friday/Saturday/both days), 1 l of burčák is about 80kč, taxis double the fare. In 2016, there were about 87 000 visitors , making it the largest wine festival in Czechia. You ought to book accommodation well ahead if you intend to sleep in Znojmo or around. For more, have a look at this review of Czech wine festivals, burčák and Vinobraní,. To see the official Znojmo Vinobraní website click . For more on wine tourism see the Drink section. Try white wines from the Znojmo wine region! The Znojmo wine region has its own VOC label. Find a list of certified VOC wineries on the Czech VOC website. There is also a VOC information center at Vlkova Věž in the town center. You can find more information on wine/wineries in the Znojmo region and elsewhere in Southern Moravia here. Nový Šaldorf-Sedlešovice - Find a street full of wine cellars in this small Znojmo suburb. This page was last edited on 23 January 2017, at 08:06.